The Jonzes Band – 7:30 – 11:00PM. Participating Restaurants (or food vendors) this year include: s Bahrs, Chilangos, Clam Hut, Francesco’s, Lusty Lobster, Moby’s, Windansea, Twin Concessions & HFD. Aside from road closures, Clam Fest also brings the closure of Water Witch Coffee and In the Garden. I really wish the Carla and the BID would find a way to change the Clam Fest set up so that their own members wouldn’t lose any money. Not sure what business model coffee shop has but I don’t really get them not staying open later. I know many enjoy a good cup of coffee or iced coffee in afternoon or early evening. No offense and God Bless if you can run a business and only be open a few hours a day but don’t think they or garden shop loose business cause clam fest I figure they can pick up some extra business if anything. Maybe I’m wrong? They’ve tried staying open later on a few occasions, and it just wasn’t profitable. The reason they close is because the side walk is blocked with the food vendors making it impossible to get foot traffic. You would need to know they were there and open and climb over a bunch of electrical cords to get to their doors. My armchair quarterback guess is that the issue is a culmination of factors: people think they are closed, people are too lazy to park around the block and walk, and it’s hazardous trying to traverse the utility hookups. Perhaps in years past they’ve seen a massive drop-off in business and rather than trying to convince people they are open it’s just easier to close. You are completely wrong, on all accounts. Actually, maybe try to run a business in this town….might open your mind 🙂 Everyone thinks they know everything – until they try! Who is wrong on what accounts? 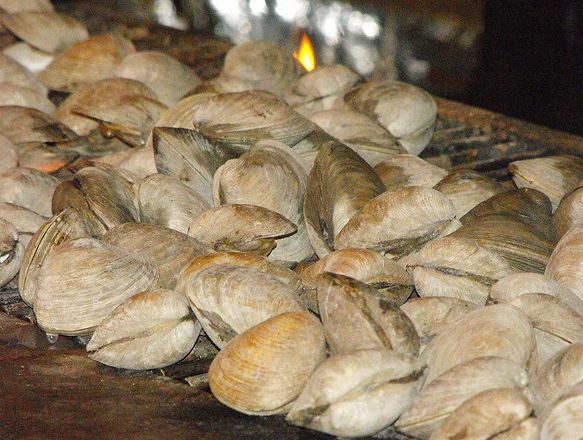 Has anyone been down to see the clamfest yet. I know it was rained out tonight, but I got to see it and I was rather shocked. yes, the usual restaurants, fire dept. and vendors are there. But there are only about 3 small rides, nothing in the VFW lot, and I only saw one games trailer. The rest of that part of bay ave. is empty and its obvious that things have been spaced out to make it look bigger than it actually is. The big laugh is the roller coaster depicted on the Clamfest bill board on Route 36. Where the hell is that at? Maybe its an invisible roller coaster? Does that count as false advertising? Over the past few years, the clamfest has become more and more lame. Overpriced food, with really nothing to see at it, other than stuff to buy. So, whats the point of even attending it? My question is if its only going to get worse why even bother having it. I think if I was a buinsess paying for the HBP, I would be rather upset, and want to know when my money is going. If the answer is advertising, I would ask, advertising for what? and why? Jersey may be stronger than the storm, but if this is the best display Highlands can put on, then the town is definately not showing it is. And if the HBP didnt have the money to make the clam fest better, than maybe the town should have used some of the money from the fees it wouldnt wave that residents have to pay to rebuild their homes! And where is that money going? I’m glad I’m not the only one. Usually they’re bringing in tractor trailers full of rides by Wednesday but I saw nothing even as I left for work on Thursday. By the time I got home the rain set in so I didn’t think they’d be open but was still surprised at the lack of rides. I meant @Rockemsockem…sorry, I just get annoyed when people assume what a business should do or not. Actually @ I forgot I’m self employed and know how hard business is and work hard to get customers and keep them so I don’t assume with all due respect you should do the same. Sorry for wanting to buy a cup of coffee later in the day. I just take my business elsewhere. If we’re wrong, please tell us on what accounts. It might help us open our eyes. Thanks! You would think that the town would want to try to put on its best face after Sandy. That would seem to be the smart thing to do.But………. this is Highlands…………so……………. The reality is that the clam fest gets lamer and lamer each year. Also for the expense and effort involved, the inconvenience to residents, noise, incidental expenses incured by the Borough and such, the event has never seemed to engergize the businesses, and seems to provide only a temporarly boost in profits to some, and is actually to the detriment of other businesses. Lets get real McLeod, the Clam Fest has been the same for many years now because the HBP president lacks original thought. It allows Carla to look like a big shot while providing her family, friends and political allies with food, beer, wine and free ride bracelets. It’s the same old bands year after year with a few minor changes, but somehow the Jonesz Band is always there. Maybe those rumors are true. Whatever the case my be, some new ideas are desperately needed. All the children in Highlands should have been given free ride bracelets Disgraceful that cronyism goes as far as whose children get free rides. Couldn’t even give families of this town a break for one weekend after all the trauma they have been through. The depth of arrogance even during what should be a happy event is sickening. When somebody asked one of the ride operators about bracelets they said only the Mayor’s friends get bracelets. I personally saw Mrs Mayor handing them out to her friends. Not cool! Just another blatant example of the things wrong with the town. Some people think that their “position” exists for their benefit, when in reality its supposed to be for the benefit of the people in the town. I mean, why dont we just live under a monachy already???? Entirely disgraceful, but we have seen these kinds of things before for years now. People need to keep these kinds of things in mind when casting their votes. If you take advantage when it comes to small things, what else will a person do? First of all i was shocked at the overall turnout which was very impressive, especially Friday night, and Sunday. Most of the restaurants were running out of food by sunday. Overall clamfest: B- Not what it has been in past years for sure, but it was there and positive. Pricing of Food: D- Much of the food was way overly expensive. At one stand I had 2 lemonades, a very small basket of shrimp and fries, and small basket of calamari which cost 30 bucks! Im sorry, but just a tad pricey! General vendors: B- , lots of em, but most of them the same as in past years. Music: A-, Very good except for one chick on Sat. Who’s talent was to vocally mutilate the hits of the 60’s, ad 70’s. All the other bands were pretty damn good. Games: F, what games??? There was like only one games trailer. For what is was it was on the good side, but the event needs to get better every year, and not backslide. One the up side, the majority of the crowd was not the local yocals, but tons of out of towners. yes, the restaurants and vendors make oodles of cash, but the event never seems to translate into a rensaissance for the towns business district.